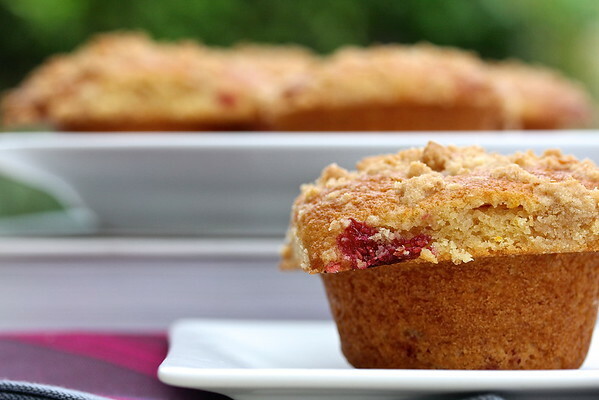 These Raspberry Jam Crumb Muffins are very tender and moist, filled with raspberries and a swirl of raspberry jam, and then topped with streusel. I made my own raspberry jam to fill these muffins, but jarred jam would work just as well. What's so cool is that you can use either frozen or fresh raspberries, so you can have these muffins any season. The tops of these muffins kind of bring to mind an old Seinfeld episode. Does anyone remember "top of the muffin to you!"? If you'd like a smaller muffin top, make twelve muffins instead of the ten that the recipe calls for. I'm also pretty excited about the streusel topping. I tried making one before, for this berry focaccia, and wasn't that thrilled. 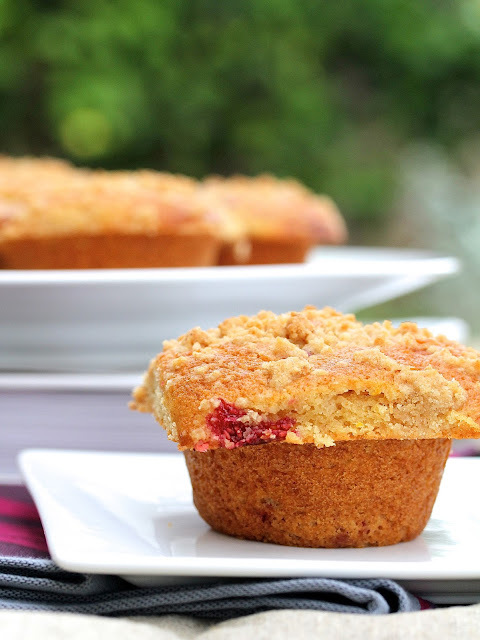 The streusel on these muffins is just right, and adds just the right amount of crunch to the tops of the muffins. It will definitely be my go-to recipe for any streusel emergency. 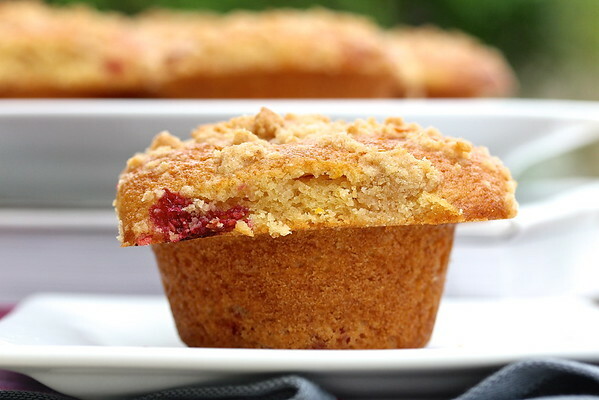 I am so happy with the base recipe for these muffins, and can see adding any kind of fresh fruit (blackberries, peaches, strawberries, apricots, apples, cherries, for example) to it to make a delicious, fluffy, and light muffin. This amazing batter includes fresh orange juice and orange zest, which you don't really notice, but add just a hint of citrus, without overwhelming the flavor. It's pretty tasty. After the recipe, check out the rest of the fabulous muffins created by the #MuffinMonday participants. Recipe adapted from the wonderful Sarabeth's Bakery cookbook and the May/June, 2009 issue of Cook's Illustrated. Mix the flour, sugar, brown sugar, cinnamon, butter, and vanilla with a spoon. With your fingers, pinch the mixture until crumbly. Add the berries and sugar to a nonstick sauce pan. Heat over medium low heat and smash the ingredients with a spoon or a muddler. Simmer for about five minutes, until you have 1/4 cup of jam. Remove from the heat and set aside. Preheat the oven to 400 degrees F with a rack in the center. Butter the cavities and top of a 12 cavity muffin pan. Grate the zest from the orange and add it to a medium bowl. Juice the orange to produce 1/3 cup of juice and add it to the zest. Add the oil, milk, and eggs to the medium bowl with the zest and juice and whisk. In another medium bowl, whisk the flour, brown sugar, baking powder, and salt together. Add the dry ingredients to the wet ingredients and stir with a wooden spoon until fully combined. Fold in the raspberries. Scoop the batter into the cavities of a muffin pan with a large ice cream scoop or 1/4 cup measure. With a small spoon, push a teaspoon of the jam into the center of each muffin. Stir the muffin with a skewer or chopstick in two or three figure eights to create a swirl of jam inside the muffins. Generously sprinkle the muffins with the streusel. Bake the muffins for 10 minutes. Reduce the heat to 375 degrees F and bake for another 13 to 15 minutes, until a cake tester comes out clean. If your berries were frozen, allow a couple more minutes. Cool the muffins in the pan for 10 minutes. No one wants a smaller muffin top! The muffin tops are the best part, especially when covered with streusel like yours, Karen. I love the little hint of red raspberries peeking out! Ha ha Stacy! I agree. I pick around the edges, then eat the top, and then work on the "stumps." These sound delicious and I love that they are filled with homemade jam instead of store bought. Exactly what I've been having for breakfast! These are definitely not muffins I could throw together while my water is boiling/tea is steeping/I'm half awake. I need my fully caffeinated awareness for these gems! I bet these would be tasty with my spiced peach and raspberry jam (I had some of each fruit on hand and decided to throw them together) and a fruit blend. Something to remember when I've got the band fundraiser fruit in the fridge! I love the top that you got on these muffins! I'm always working on getting more impressive muffin tops. These were a little "over the top." tee hee. It has never occurred to me to make fewer muffins to get larger tops. I don't know why because it makes perfect sense. And yes the tops are awesome--I want that streusel! And baking with frozen berries all winter long is how I remind myself the world will eventually be in color again! 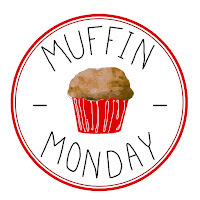 I joined a muffin group Sally and we post on the same day as SRC. I was wondering how you can do so much! OH, well - what matters is to have fun with it, right? These muffins look stunning! And I love a big muffin top, so I wouldn't change a thing about these. =) Delicious! Looks delicious....love raspberries. Perfect for a quick breakfast on the go. Thanks Alison! We did exactly that!